3. Get in the habit of turning on your headlights when you turn on your windshield wipers for driving in the rain. This will help make your vehicle more visible to others. 4. When parking, drive into a pull-through parking spot (if available), to eliminate the need for backing. Don’t race for a parking space. Follow parking lot speed limits or, if no limit is posted, slow down anyway to allow safer reaction to unexpected occurrences. 5. Don’t cut diagonally across parking lots. Drive in designated traffic lanes and directions. Turn off radios and other electronic devices to prevent distractions when driving in parking lots. This will help you stay fully alert for pedestrians, bicycles, light posts, and other vehicles. 6. Don’t pump the brakes if your car has an anti-lock brake system (ABS) because pumping will disengage the anti-lock system. When the ABS is activated, it automatically pumps the brakes for you so don’t be alarmed if you feel the pedal pulsations or vibrations. Always “brake and steer” when using four-wheel ABS. 7. Don’t slam on the brakes if you have a blowout on the highway. 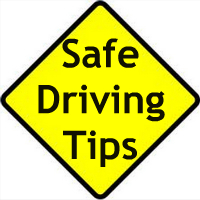 Take your foot off the gas pedal to let the car slow down gradually and steer your vehicle towards an exit, the shoulder, or other safe location (using directional signals, if needed). 8. Be seen-be safe. Wear a high-visibility vest each time you exit your truck in the company yard, at your customers dock, and on the side of the road.